Promoter Bob Arum wants his Japanese star Ryota Murata 14-1 (11) to face undisputed middleweight champion Gennady Golovkin 37-0-1 (33) in a big Fall pay-per-view extravaganza is everything goes to plan. The 2012 Olympic middleweight champion made easy work of light-punching Italian Emanuele Blandamura 27-3 (5) in Yokohama, Japan on Sunday night, stopping him in the eighth round. “Another great knockout victory for the champion, Ryota Murata. Next stop: Las Vegas,” said the Top Rank boss Arum, who co-promotes Murata with Akihiko Honda of Teiken Promotions, was quoted as saying on ESPN.com. Murata, who hold the WBA “regular” title behind Golovkin’s WBA “super” championship, concurred with his American promoter. “The fighter I want is Golovkin. 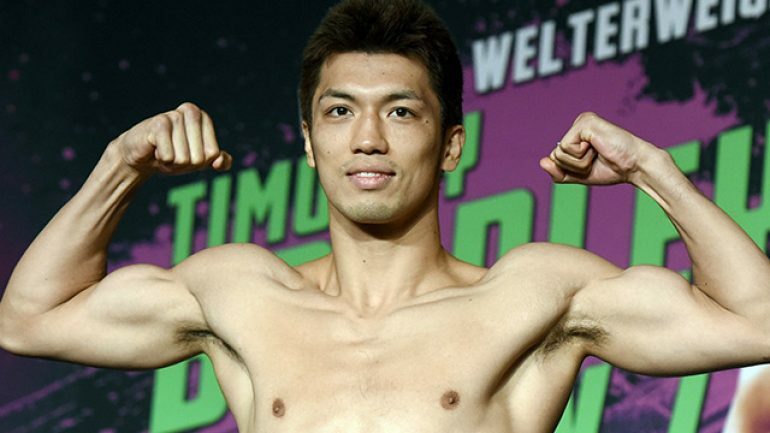 I want to keep improving, and I’m thankful for the support of my fans in Japan and worldwide,” the 32-year-old Murata said. The hard-hitting, six-foot tall Murata didn’t face much opposition from Blandamura, who didn’t have the power required to keep the champion off him. Murata had the challenger hurt in half the rounds contested before finally finishing him off in the eighth with his patented right hand. The plan for a Golovkin-Murata fight would be to host it in Japan, possibly at the Tokyo Dome where Buster Douglas upset Mike Tyson 28 years ago, with the Olympic gold medallist already a big star in his native country. It is already being reported that his tune-up fight against Blandamura was watched by 16 million viewers in Japan out of a population of 127 million people. With Golovkin’s immediate options at middleweight up in the air in the wake of Canelo Alvarez’s positive drug test for the banned substance clenbuterol, it’s not a bad move by Arum to try and position his fighter as a viable option in the late stages of the Kazakh bomber’s storied career. Next up for Murata will be a voluntary title defence against Brazil’s Esquiva Falcao 20-0 (14) in either June or July in Las Vegas, Nevada. A strong showing will be needed to get the American audience behind the idea of a fight with Golovkin. There is history between Murata and Falcao. The two of them faced off in the finalso f the 2012 London Olympics with the Japanese fighter winning a close 14-13 decision in a fight that could’ve easily gone either way. Still, Arum is confident in his boxer’s ability to not only get past Falcao, but also spring the surprise on Golovkin if he can get the fight made between the two of them later this year. “Murata has such a big size advantage over Golovkin, which will enable him to win the fight,” Arum said.